Google has outlined a 'new approach' to how it plans to operate in China, following the long-running and highly publicised battle with the Chinese government over censorship. Google has been redirecting search inquiries in China via its unfiltered site in Hong Kong, since pulling its Chinese-based operations out of Beijing. However, Google is now set to stop doing this, otherwise it risks losing its licence to operate in China from the Chinese government. 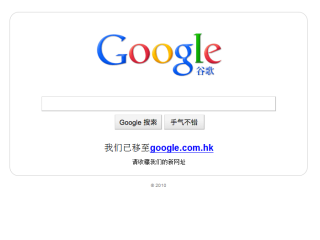 Google users in China will instead be directed to a page from which they can then get a link to access Google's Hong Kong site. "Ever since we launched Google.cn, our search engine for mainland Chinese users, we have done our best to increase access to information while abiding by Chinese law," notes Google's David Drummond, SVP, Corporate Development and Chief Legal Officer on the Official Google blog. "This has not always been an easy balance to strike, especially since our January announcement that we were no longer willing to censor results on Google.cn." "However, it's clear from conversations we have had with Chinese government officials that they find the redirect unacceptable—and that if we continue redirecting users our Internet Content Provider license will not be renewed (it's up for renewal on June 30). Without an ICP license, we can't operate a commercial website like Google.cn—so Google would effectively go dark in China. Google.cn now takes users to this landing page on Google.cn that also links to Google.com.hk— "where users can conduct web search or continue to use Google.cn services like music and text translate, which we can provide locally without filtering. This approach ensures we stay true to our commitment not to censor our results on Google.cn and gives users access to all of our services from one page." Google pulled its operations out of China back in March, as a move against state censorship in the country.